Eighteen years after the release of one of my favorite movies, M. Night Shyamalan returns to write and direct the last movie in the Unbreakable trilogy. Glass concludes the three movie story arch with a bang. The start of Glass sees David Dunn (Bruce Willis) working with his son, Joseph Dunn (Spencer Treat Clark), to rid his city of crime. They’re working in a security business during the day. During the night, David goes out to fight crime as The Overseer. Their next big target is Kevin Wendall Crumb and his many personalities (James McAvoy), the main villain from Split. David has helped capture Kevin. Upon the capture of Kevin, David and Kevin are sent to a psychiatric hospital run by Dr. Ellie Staple (Sarah Paulson). Elijah Price, Mr. Glass (Samuel L. Jackson), is already housed in this facility. This is where Glass gets interesting. And where we’re going to dig into the latest Reel Leadership lessons. Let’s get ready to discover the leadership lessons in Glass! Two thugs had attacked a man with groceries. One man filmed the other as he “Superman” punched the hapless victim. David had seen this happen and knew something had to be done. He followed the two men to their house. He waited until they were relaxed. Then he pounced. David broke into the house. He found the two men. And he took them out. This helped rid the community of two thugs who were praying on the citizens. You won’t go about helping the community in the same way David Dunn. Instead, you can do much more. Be a leader who gives back to their community. Find ways to help your community flourish. One of David’s unique skills was the ability to see what others had done in the past. All he has to do is touch a person and he can see what they’ve done. He brought this skill to the city he lived in. During his hunt for Crumb (or The Horde), he would routinely walk through the city, touching people, and viewing their sins. He and his son had deduced The Horde was operating out of a building near the industrial district. David went there. He used his powers and touched as many workers as he could, hoping he would eventually find the criminal. David did find The Horde. He then used his comic book inspired power to defeat him. Do you know your strengths? How are you using them? Are you using your strengths only to benefit yourself? Great leaders know they have the responsibility, as Peter Parker’s Uncle Ben would have said, to do good. In the first leadership lesson from Glass, I mentioned ways to help the community. You help your community and others by doing good. Use your God-given talents and strengths to good. Dr. Ellie Staple was running the psychiatric department David, Kevin, and Elijah was housed in. She also knew what they believed to be their weaknesses were. David believed water was his weakness. Kevin’s weakness was the light. Elijah’s weakness was his brittle bones. Dr. Staple equipped each of their rooms with their weaknesses. David’s room had water outlets installed. Kevin’s room had strobing lights. And Elijah’s room was padded and locked. He was also doped up on drugs. You need to study your competition. Discover where they are weak. Then look for ways to step in and work their weak points. Doing this will allow you to fill a void being missed by your competition. You will see what people want and then be able to focus in on that aspect of business. Fill the void, win customers. Kevin Wendall Crumb was broken. He had Dissociative Identity Disorder (or Multiple Personality Disorder). His mind was fractured into 24 unique personalities. As you can tell, Kevin is fractured. He’s broken. Many of the people you will interact with are broken. They may not have DID but they are not whole. They’re missing something or have been hurt. Leaders have to take into account the brokenness of the people they lead. The brokenness of people plays into how they react to situations. Be aware of people and their issues. Doing this will help you make leading them much easier. This cause isn’t about me. Many of the personalities of Kevin wanted The Beast to be the dominant one. They believed he would set the world right. This allowed Priscilla to utter the above quote. She believed the cause was more than her. There was something greater to strive for. As a leader, you need to have a similar mindset. Leading isn’t about you. Leading is about a greater cause. Work at putting your selfish desires aside. Instead, keep laser focused on what everyone is working towards. In a flashback to the time of Unbreakable, a young Joseph tells David he wasn’t scared. Joseph told him he knew David would keep him safe. David made his son feel safe. He took away the fear the young boy felt. The fear was replaced by a calming peace given to him by David. Being under a leader can be a scary thing. Your team members may have to worry about losing their job, being treated unfairly by you or other team members, or making a mistake. These are all common fears. They’re also fears a great leader can help alleviate. Show your team members you have their back. You’re there to help them as much as you are to help the organization succeed. Give your team members peace of mind. Take away their fear by showing them you are for them. In Split, The Beast allowed one girl to escape. This girl was Casey Cooke (Anya Taylor-Joy). And she returns in Glass. Casey is talking to Kevin in one scene. She thanked Kevin for letting her go and giving her the strength to put her uncle away for the things he had done to her. Casey’s uncle had physically and sexually abused her. Kevin’s mother had physically abused him. Casey relayed the abuse to Kevin and helped him realize he wasn’t alone. He and Casey were more alike than Kevin knew. You and your team members are more alike too. You all have life experiences that intertwine and intersect with one another. In the end, you and your team members are alike. Don’t forget this. Dr. Staple began to analyze David, Kevin, and Elijah. She then began to implant doubts into their minds. How there were professional guessers out in the world. They could pick up sights and scents others couldn’t and use this to guess where others have been. She used this to make David doubt his abilities. How there were great rock climbers that could scale walls. Kevin had multiple videos of rock climbers and maybe this was how he learned to climb so well. How there were intellectuals who could best the average man. Elijah was smart but it wasn’t a superpower. It was natural ability. Making the superhumans in Glass doubt, Dr. Staple almost made them believe they weren’t special. She almost had them believing they were everyday people who were delusional. Are you making your team members second guess themselves? Are you making them doubt their skills and strengths? Be careful how you approach them. You want them to believe in themselves. You want them to feel special and know they can succeed in what you’re asking them to do. Help them realize they are wise and strong. Stop making them think they’re dumb and weak. Stop being a bad leader. Elijah was duping the doctors. He pretended to take the medication they were giving him. He wasn’t. Instead, he was hiding the pills and pretending to be sedated. During this, he was plotting how to escape and show the world superhuman people existed. His capabilities were hidden. They were being used in the background. Most of all, they were being wasted. Did you know you have some really smart and talented people on your team? If you hired them, there has to be something special about them! But did you also know most of them aren’t using all of their skills and talents? Some of your team members are hiding what they can really do. And it’s up to you to help them display their talents. Give your team members the chance to do things outside of the scope of their job description. Allow them to work on passion projects that aren’t related to their job. Google had allowed their team members to work on projects special to them, even if it wasn’t something they were assigned to. This allowed them to work in areas that they normally wouldn’t. It also allowed them to create some pretty neat innovations. Could you allow your team time to work on something outside of their scope of work? What could be possible if you did? Dr. Sharpe worked hard to get the three superhumans to doubt their abilities. In doing so, she was taking away the power of belief from them. The personalities of the Horde eventually broke through. And they began to believe again. This gave them the strength they once had. Belief is a powerful tool. Believing in what is the right thing will give you the strength you never knew you or your team had. Believe in yourself. Believe in your team. At the end of Glass, you see Elijah, The Mastermind, had a plan the whole time. He wasn’t expecting to make it out of the psychiatric hospital alive. Instead, he was hoping to spread the word about superhuman beings. When Elijah and Kevin had escaped, Elijah began programming the security cameras set up in the hospital. He programmed them to record the battle that was going to happen between Kevin and David. Then, he scheduled the recordings to be sent to Casey, Joseph, and his mother, Mrs. Price (Charlayne Woodard). He had a plan the whole time. He used his cunning mind to see where things would go and how he would have to play things. Great leaders, even if they’re bad, have a plan. They have thought things through and set in motion actions to accomplish their goals. Do you have a plan? What are you doing to get to accomplish your goals? You need to know this so you can work towards them! Belief in oneself is contagious. One of the plot twists people didn’t see coming in Glass was that there is a secret organization working to hide the fact superhuman people exist. This cabal, The Clover organization, was taking out humans with abilities before they could be exposed to the world. This was one of the reasons Dr. Sharpe was trying to get Kevin, David, and Elijah to believe they were normal. They couldn’t be out there and show the world people could do great things. Elijah, knowing this organization was out there, knew belief was what people needed. He could help by exposing it. Once again, we come back to the power of belief. Believing in yourself is contagious. If you believe you’re special, others will begin to believe they are special too. Help spread the contagion of belief. One of the really fascinating things about Glass is how long it took to get from Unbreakable to Glass. Nineteen years passed between the three releases. Still, in all this time, so many actors and actresses returned. This includes the actor who played Joseph Dunn in Unbreakable and the actress who played Mrs. Price. Despite the time between the films, these two professionals returned along with the main characters! Why would something like this happen? Joseph and Mrs. Price seem like minor characters in the grand scheme of things. Yet these people reprised their roles. I believe it is because they wanted to be part of something special. Something meaningful. Are you creating something meaningful in your organization? Doing so will help bring in people who will be there for the long-term. They want to be part of something special. Give them something special to be a part of. Question: Have you seen Glass? If so, what leadership lessons did you take away? 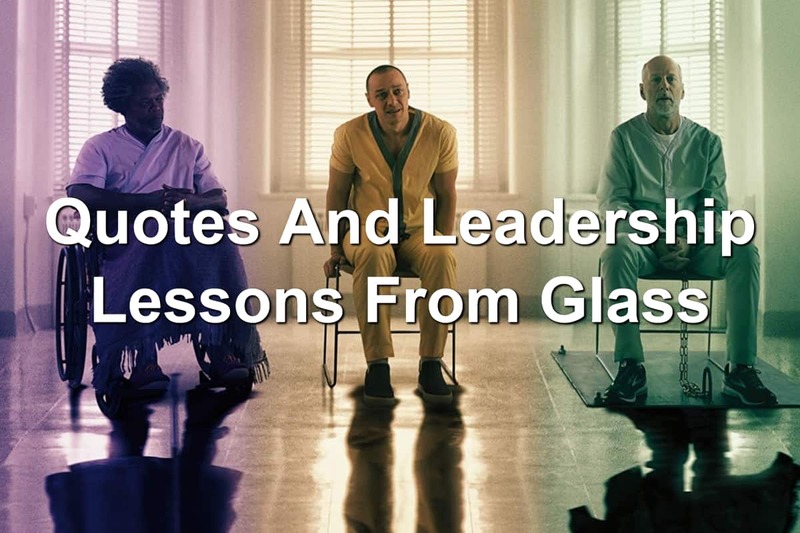 If you haven’t, what leadership lessons from Glass that I shared resonated most with you?